Whether it’s for comparing the effectiveness of product lines or business units within your company, or the effectiveness of your company against close competitors, benchmarking is a vital continuous improvement tool. And although it’s safe to say that the average executive understands the benefits of benchmarking performance, that doesn’t necessarily mean his or her company has ever participated in such an initiative. We’re passionate about helping companies achieve operational excellence, which is why we took on the responsibility of running the Metrics that Matter research study in 2013, in conjunction with the MESA organization. Since the beginning of the study, we’ve collected over 200 responses from executives and senior leaders in some of the top manufacturing and industrial organizations. The preliminary results are showing interesting data on benchmarking. Forty-five percent of executives said they have no plans to benchmark performance at any time in the near future. 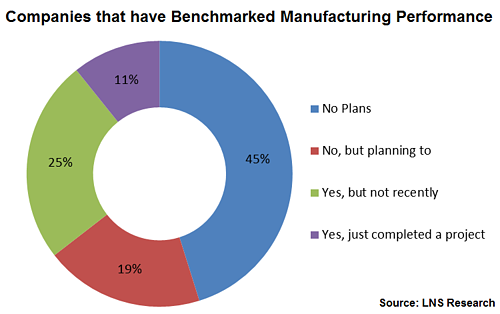 Nearly 20% said they have not yet participated in a benchmarking project but plan to, and the remaining 36% have at least one project under their belt. The concerning issue is that well over half of the companies that participated in the study have yet to take advantage of one of the most important continuous improvement tools. If you're an executive that hasn’t bought into benchmarking manufacturing performance, below are 7 reasons why you might want to reconsider that strategy. Having a thorough understanding of your own performance can only get you so far. For instance, if you’re working to improve year-over-year new product introduction defect rates, it might benefit you to understand the current industry average. Where one or two percentage points can have a dramatic impact, that intelligence may warrant an investment or reallocation of resources. Benchmarking doesn’t necessarily have to be an exercise that requires competitive intelligence. Many companies—especially large and distributed ones—benchmark performance of facilities and products having similar processes as well as metrics and KPIs. Again, this analysis can lead to deeper investigations as to why a particular facility, product, or business unit is underperforming. Without an internal or external benchmark for comparing performance, it can be a challenge to set precedents every year. Benchmarking projects and reports give you perspective on what’s considered “good” performance, and can be an instrumental tool for measuring the effectiveness of facilities, product lines, business units, and even particular personnel. Even benchmarking a high-level metric such as overall equipment effectiveness (OEE) can result in some serious discussions amongst leadership. Many companies carry out such benchmarking projects, and then drill down into the variables to identify where the real culprits of underperformance reside. 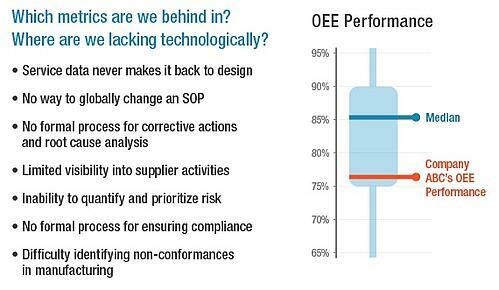 OEE, for example, can be broken down into components of quality, availability, and efficiency. A disparity between industry averages could surface as a disparity in quality management process and/or software capabilities. The process of undertaking a benchmarking project can encourage organizations to invest resources in standardizing the calculation of metrics and KPIs. The challenge is that metrics such as OEE and the cost of quality can be calculated in numerous ways. Whether it’s adopting industry standards or just making sure calculations are standardized across your facilities, having a solid baseline for comparison is one of the keys to successful metrics program as well as benchmarking projects. Providing metrics performance visibility to shop floor workers all the way up to the top floor allows personnel to understand how their actions impact certain areas of business. Adding an additional layer to those key performance indicators, showing them how their current performance compares to industry targets or even internal targets, can be incentive to drive productivity and innovation needed to exceed those averages. Market leaders are the ones that exceed industry benchmarks. If you’re comparing on-time deliveries or first pass yield, benchmarking can provide a better outlook as to where you are versus where you want to be. The challenge is that successful companies are no doubt working to widen the gap. Are You Ready to Benchmark Your Performance? If you’re interested in learning more about benchmarking or starting a benchmarking project, a good place to begin your journey is in our Performance Management Library. The library has several key reports around benchmarking and improving manufacturing performance.